a.pass end-communications is a public event for the sharing of the one year trajectories of the a.pass researchers. It’s a moment to bring to a larger public the questions and methods that their practice of artistic research at a.pass entailed. The event focuses on the sharing of their processes and on the invitation to reflect on the emerging topics and concerns of their research question(s) in the context of artist practice today. ‘If a question could lie’ brings forth or wants to insist on the agency of the question. It aims to raise the issue of the appearance of criticality and its location. It’s as much claiming the right to pose a question as opening its ability to gather around a multitude, a poly. It could be read as a dating strategy. Saying, I wouldn’t be here if I weren’t interested. The I being the issue and the subject, at the same time. The set up for this End-Communications addresses the agencies of ‘performing’, ‘publishing’, ‘curating’ and ‘soft architecture’ as strategies for artistic research. It focuses and exposes text, performance, installation, technological apparatus as chapters, editorial parameters, contexts for the reader-audience. It wants to bring together a ‘collection’ or ‘assemblage’ of performative materials that are autonomous on themselves but brought together in relation to one another in a permeable physical space. These materials are the indicators of processes of thinking and doing which are not conclusive on themselves but that are on the edge of making emerge or unfold questions, meanings, feelings. 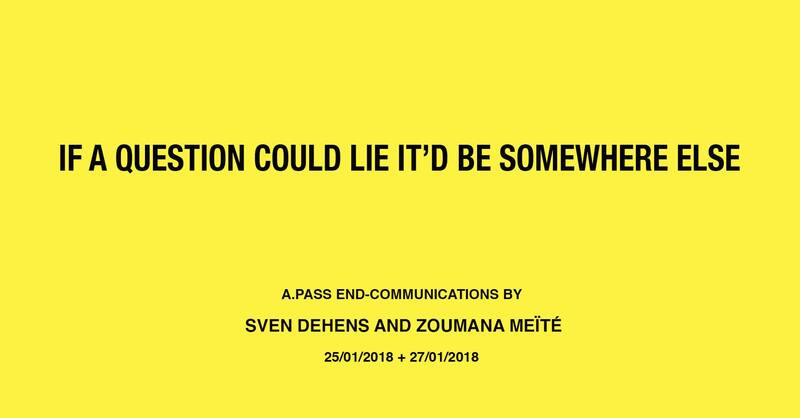 Over two days Zoumana Meïté and Sven Dehens invite you to come, see, listen and share. They will present their means for changed ways of reading, pointing and publishing. Practiced Dramatic Arts in different context (street, contest, Studies, social, laboratory, company, outside look, postmaster…). He is working as staging dramaturgist in Brussel. We recommend you come for the full evening. In addition to the end-communications two episodes of the Close Encounters series will take place in the afternoons on the same location.